Showing is not just for ribbons. It’s to show your abilities at their best and to go back and work hard to improve your partnership with your equine partner. Every year we conduct two shows for the people who board or take lessons here – an informal show in the spring and a more formal show in the fall. These shows prepare students for other competitions and provide feedback for more practice in areas of need. We bring in an experienced, impartial equine judge to evaluate and score the participants. Six ribbons are awarded in each event, including ones for Champion and Reserve Champion. People of all ages compete, with horses and riders grouped according to ability. Everyone had a great time at our May schooling show. We had a big turnout of riders, along with an appreciative audience to cheer them on. The weather cooperated, too – a beautiful morning! Riders and horses demonstrated skills at both flat ground work and jumping, all the way up to 3’ 3”. This is one of the highlights of our year, and the May show once again gave us an opportunity to get together, have fun, and enjoy one of the things that we all love most. Photos below by Cerella Chandra Photography. Virginia and Maryland are horse country and are host to a large number of equine competitions at all levels throughout the year. People who board and ride at The Overlook Farm, including our own instructor Terri Jones, participate in many of these events, including local, rated, and team competitions. Terri helps her students prepare for these competitions and when asked, provides trailering to and from the sites. The shows held at The Overlook Farm are excellent ways to prepare and hone horse and rider skills for shows elsewhere. Many others from The Overlook Farm attend the shows to provide support for our competitors. What a great way to spend a day! 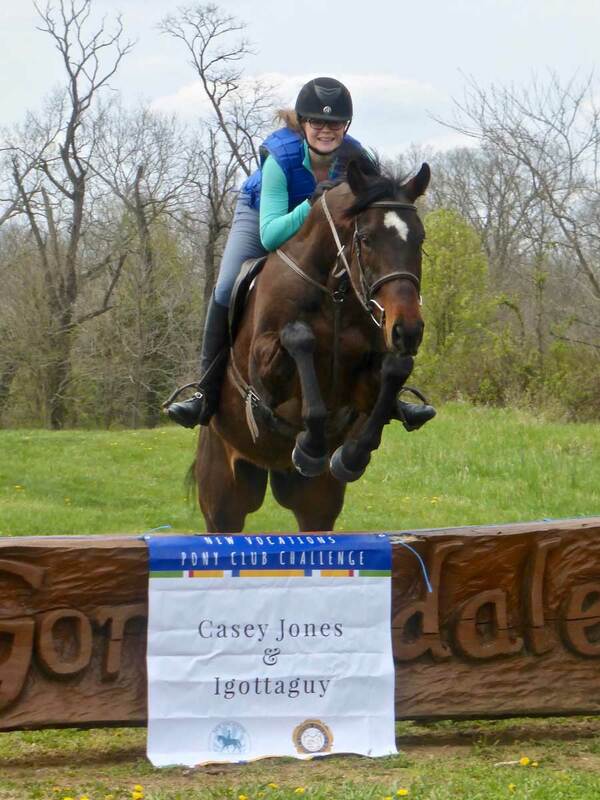 This is Casey Jones and her horse Igottaguy competing at the Pony Club Challenge in April 2018. Igottaguy is Casey’s new young horse, who she is training to be an excellent eventer. Looks like she is succeeding! Congratulations, Casey! At the Christmas Derby at Loch Moy in December 2017, Julia Fugate won first place in the Beginner/Novice division. Kiera McMullen placed sixth in the Intro division. Casey Jones competed at the Novice level. Way to go, ladies! Congratulations to Lucas Garvey and Casey Jones for their tremendous individual and team achievements at the U.S. Pony Clubs Festival in Lexington, Kentucky July 18-24, 2017. One of the biggest events of the year, the Pony Club welcomed over 3,000 members, their families, friends, volunteers, and Pony Club leadership from across the country to Kentucky to enjoy competition, learning, and fun. Lucas’ team took 1st place in horse management and 4th place in dressage riding. Casey had an individual ranking of 11th out of 248 people and her team ranked 6th out of 20 teams. In addition, Casey achieved a perfect turnout inspection in show jumping. Way to go, Lucas and Casey! Congratulations to Lucas Garvey, Casey Jones, and Annaliese Meistrich for their great success at the Virginia Region Pony Clubs Dressage Rally on May 7, 2017. Lucas took the first place Blue Ribbon in the Musical Freestyles. Casey earned third place and Annaliese took fourth. All three were trained by Terri Jones. They are with the Casanova Warrenton Pony Club. An impressive and well-deserved showing by the folks from Overlook Farm! Congratulations to Sonya Hunt for her success at the Potomac Valley Dressage Association Competition at Morven Park on May 21, 2017. She and her horse Aliea took first place in the Prix St. Georges test! Terri Jones and her mount Dutch King participated in their first Open Prix St. Georges test, getting 4th place and 5th place. On June 10-11, Terri Jones took a first place in the FEI Prix St. Georges test at the Summer Dressage Competition held by the Virginia Dressage Association – Northern Virginia Chapter. This entitled her to a USDF silver medal. Congratulations, Terri!